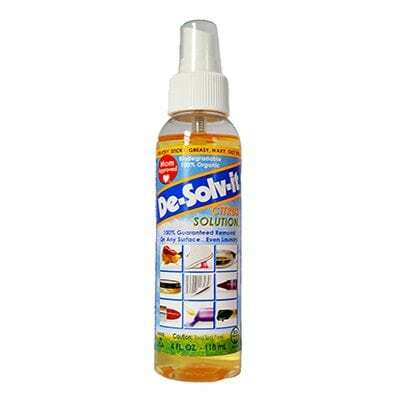 De-Solv-It Adhesive Remover is 100% organic, 100% biodegradable, eco-friendly citrus based product. Great for removing not only adhesive stickers… it can also remove, crayon, food/gum, lipstick, candle wax, tree sap, oily residue on stoves tops and so much more. Use on almost any surface from colorfast washables, carpet, concrete, stainless steel, upholstery, wood, to counters and garbage disposals – even skin and hair! You will reach for De-Solv-It on a daily basis! 4 oz. spray bottle.